Over 9" (23cm) Long. See the video. Thunder Cruiser. - Lithographed Pop Pop Boat. Pink. (See video below). 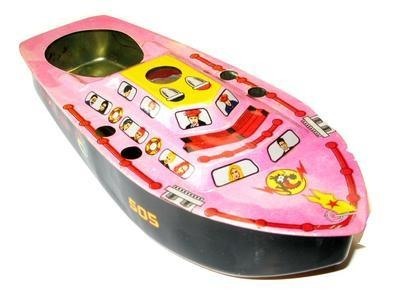 One of the largest boats available - Over 9" (23cm) Long. To Quote a well known film - "We're gonna need a bigga boat" - well this is it. We recently tried solid fuel tablets with this model - WOW ! They are made by Gelert (for outdoor cooking / camping etc). The noise and power with this huge engine is not for the faint hearted.